Download a new tutorial every day. 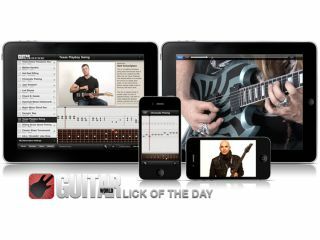 PRESS RELEASE: Guitar World, the world's best-selling guitar magazine, and Agile Partners, developers of 2010 Apple Design Award winning app TabToolkit, announce the availability of the Guitar World Lick of the Day App on the App Store. High quality videos of Guitar World's instructors and guitar celebrities, such as Zakk Wylde, Joe Satriani, Gus G., and Phil Collen, demonstrating licks in a wide range of styles: Rock, Metal, Blues, Country, Jazz and more. Timeless celebrity videos from the Guitar World Vault. Standard and tab music notation for each lick that scroll in sync with videos on iPad. Practice mode with settings that control music notation tempo, looping, audio synthesis, a metronome and more. Dynamic fretboard that shows finger positions synchronized with the scrolling music notation (lefties can invert the fretboard). Performance notes written by Guitar World instructors. 'Star' your favourite licks to find them later easily, and sort licks by genre and difficulty. Download licks to any iOS devices that you own - iPad, iPhone, and iPod touch. Scott Roth, a principal with Agile Partners, shared, "Lick of the Day takes full advantage of the responsiveness, larger screen, and user interface elements of iPad," added Roth. "On the large, high-resolution display, we render bright, crisp music notation that scrolls in sync with the accompanying instructional video. And with a single tap, the user can toggle the notation between standard and tablature format." Information taken from official press release, for more visit the Lick Of The Day app site.